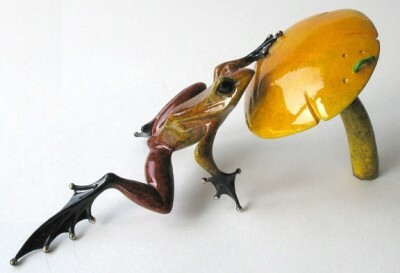 Dingley Dell, Orange variation Frogman Bronze sculpture. A wonderful, luminous orange variation of Dingley Dell from bestselling bronze artist Tim Cotterill. This edition of Dingley Dell is eye-catching with its glorious orange patina, attractively posed on a bright orange mushroom. Why not add this rare Frogman Bronze to your collection today.